A screen shot shows the new mobile app developed by IBM for the World Meeting of Families in Philadelphia. The free app is available at the Apple iTunes and the Google Play stores. 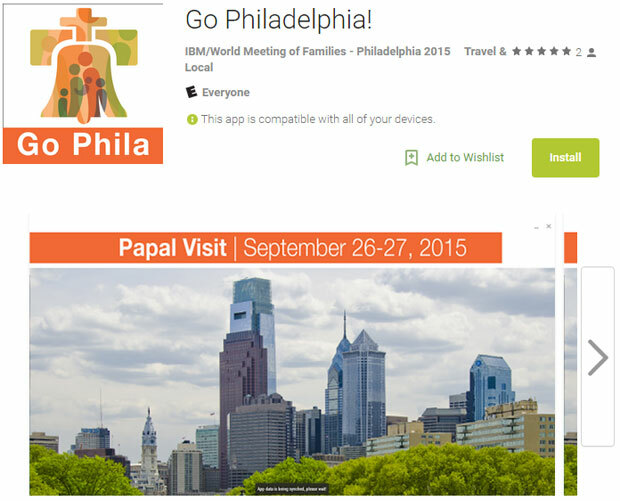 Visitors and residents coming to Philadelphia for the World Meeting of Families and papal visit this September will have a handy way to stay informed of the events through a new mobile app called Go Philadelphia. The free app, available for download on the Apple iTunes and Google Play stores, was launched July 22 at a news conference by World Meeting officials at the Kimmel Center in Philadelphia. Developed by IBM, the app was described as an interactive guide for smart phone and tablet computer users “that will provide instant access to exhibits, translation services and maps, and make it easier to experience” the September events, said IBM executive Diane Melley. In addition to a directory of content including more than 100 planned exhibitions at cultural venues is an interactive map of center city with pin points for multiple sites of interest. The World Meeting of Families congress will take place at the Pennsylvania Convention Center, and the events for Pope Francis’ visit will take place mostly along the Benjamin Franklin Parkway’s museum district. The Go Philadelphia app allows users to customize their schedule and itinerary during the Sept. 22-25 congress and Sept. 26-27 papal visit, and to share their experiences on Facebook without leaving the app. Another important feature is the app’s ability to translate in closed caption the live feed of the Sept. 27 papal Mass on the parkway into any of eight languages. “We will continue to add fresh content as we approach the big event,” Melley said. 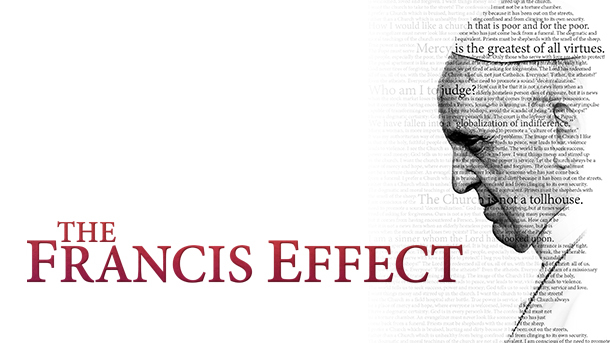 “The Francis Effect,” a film produced by Canadian Catholic broadcaster Salt + Light Media, is one of 13 films included in the World Meeting of Families Film Festival. Donna Crilley Farrell, executive director of the families’ congress, also announced the World Meeting of Families Film Festival taking place in the city during the week of the congress. The festival will feature 13 movies shown mostly at the Kimmel Center’s Perelman Theater. Beneficial Bank is the sponsor of the festival, which will be curated and run by the Greater Philadelphia Film Office. Some movies have a Philadelphia flavor, such as “The Mighty Macs,” which is about the national champion Immaculata University women’s basketball team; “Invincible,” on the story of Philadelphia Eagles walk-on Vince Papale; “Diary of a City Priest,” set in Philadelphia starring city native David Morse; and “Wide Awake” by director M. Night Shyamalan, who has made a number of films set in the Philadelphia region and who will attend the film’s screening. “Urban Trinity,” a film by former Philadelphia mayoral candidate Sam Katz on the history of the Catholic Church in Philadelphia, will premier Sept. 23 at the film festival before its broadcast on WPVI TV Channel 6. One of the two films not shown at the Kimmel Center is a sing-along for 1,000 people of “The Sound of Music” at Dilworth Plaza at the foot of City Hall. The other film rounding out the festival’s lineup is “Schindler’s List,” the Academy Award-winning film by Steven Spielberg that will be screened at Congregation Rodeph Shalom on North Broad Street in Philadelphia. The film will be attended by hundreds of area high school students “from diverse backgrounds” and their teachers as part of a student project studying the holocaust, according to Sharon Pinkenson of the Film Office. The movie will be shown Sept. 24, the day after Yom Kippur, the Day of Atonement in the Jewish faith. The festival will join “the cultural and culinary gems the city has to offer” during the third week in September, Pinkenson said. Almost all of the more than 100 cultural institutions in the city are planning special exhibits, many including religious themes, during the week. They include the Drexel University Library and University of Pennsylvania Museum, the Franklin Institute, Philadelphia Orchestra, National Constitution Center and of course, the Philadelphia Museum of Art. While Philadelphia attracted 39 million visitors last year, the World Meeting and papal visit promise to raise even that profile, and that prospect has the city’s promoters excited. One important view of that stage is the new mobile app, and IBM executive Melley said after the September events her company would customize the app for future visitors to the city. Levitz said the app’s content would concentrate on users’ needs starting Sept. 18 through Sept. 28, the day after Pope Francis leaves Philadelphia after a memorable and historic week.